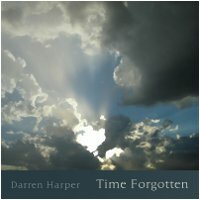 Earth Mantra again has the pleasure of welcoming a new artist to our humble netlabel, this time an ambient musician hailing from Colorado by the name of Darren Harper, who brings us this exquisite collection of introspective ambient pieces called Time Forgotten. While Darren refers to the music in the album - indeed his entire approach to art and life - as "wrestling with opposites", we find nothing the least bit conflicted in what we hear in this lush album. The music is calm and perfectly paced, with effortless waves of sound ebbing and flowing, a soft and comfortable experience from end to end. To be sure, there are moments of tension, when the music builds to a crescendo, but always there is a sense of peacefulness, of beauty, and always of purpose. Darren himself admits that the duality he battles with often ends up being illusory; the opposites in the end typically turn out to be different views of the same thing. We would submit that this music is a case in point, for it achieves a oneness that is to be much admired. In making this album, Darren used a novel approach to generative music, taking a set of sounds, deconstructing them, and then restructuring it all generatively to "reveal the story" therein. We are particularly struck by how he managed to create such ordered and cohesive music from such chaotic origins. We think he is really on to something with this approach. Darren recorded the music for this album in his cozy studio nestled in the picturesque foothills of the Rocky Mountains in Colorado, during the summer of 2009. Looking at the pictures of his home town, it is easy to understand the inspiration for such gorgeous and expansive music. And gorgeous it is. We are very happy to be bringing Time Forgotten, Darren Harper's debut Earth Mantra release, to our listeners. We hope we will hear much more from this supremely talented artist in the future. Great great album. Thank you, Earth Mantra, for such wonderful new artists. And thanks to Darren Harper for his beautiful, breathtaking work. Free music is the best.